For the television channel, see Film4. Film4 Productions is a British film production company owned by Channel Four Television Corporation. 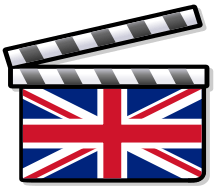 The company has been responsible for backing a large number of films made in the United Kingdom. The company's first production was Walter, directed by Stephen Frears, which was released in 1982. It is especially known for its gritty, kitchen sink-style films and period drama. Prior to 1998, the company was identified as Channel Four Films or FilmFour International. Later, the outfit was re-branded as FilmFour, to coincide with the launch of a new Digital TV channel of the same name. The company cut its budget and staff significantly in 2002, due to mounting losses, and was re-integrated into the drama department of Channel 4. The name "Film4 Productions" was introduced in 2006 to tie in with the relaunch of the FilmFour broadcast channel as Film4. Tessa Ross was head of both Film4 and Channel 4 drama from 2002 to 2014. ↑ Gibson, Owen. "Interview: Tessa Ross". The Guardian. Retrieved 24 February 2016. ↑ Plunkett, John. "Channel 4 boss Tessa Ross appointed chief executive of the National Theatre". The Guardian. Retrieved 24 February 2016. ↑ Jaafar, Ali (February 2, 2016). "Rooney Mara In Discussions To Play Mary Magdalene In Biopic". deadline.com. Retrieved October 3, 2016. ↑ Siegel, Tatiana (February 9, 2016). "Weinstein Co. in Talks to Acquire Mary Magdalene Biopic". The Hollywood Reporter. Retrieved October 3, 2016. ↑ Barraclough, Leo (February 9, 2016). "The Weinstein Company Set to Take North American Rights to Mary Magdalene Biopic". Variety. Retrieved October 3, 2016.